Following the revelations made by the New York Times as to how China Habour Engineering Company contributed money towards Mahinda Rajapaksa’s 2015 re-election during the presidential campaign, further details have now emerged. 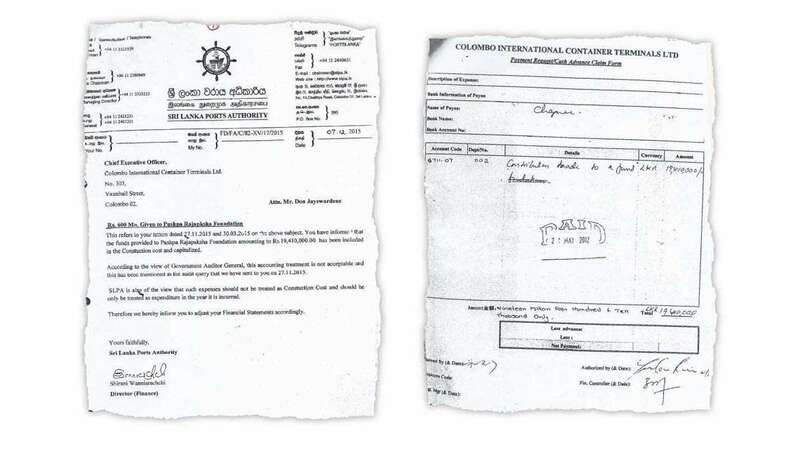 This is how Colombo International Container Terminals Limited (CICT) had ‘donated’ to a fund of a different member in the Rajapaksa family in 2012. 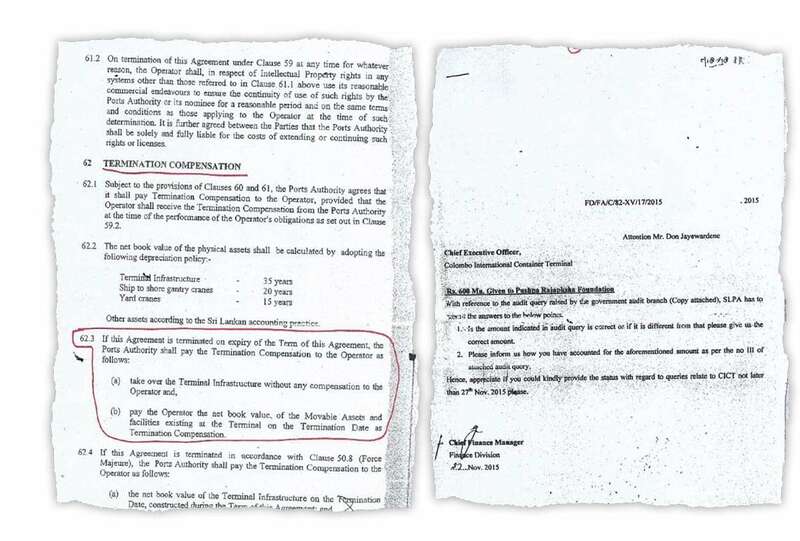 Although CICT in a press release, last week, reiterated that the payment they made was a donation in good faith, and a part of their commitment towards their Corporate Social Responsibility (CSR) programme, the is now in possession of a set of documents which indicates otherwise and how the donor company – CICT -does not intend to answer any of the questions this newspaper posed to them with regard to the said payment. The lucky beneficiary The Pushpa Rajapaksa Foundation situated at 78, Rosmead Place, Colombo 7. The chairperson of this foundation was Pushpa Rajapaksa, wife of then Economic Development Minister Basil Rajapaksa. This ‘charity’ organization had received Rs.19.41 million from CICT, the company that was offered the contract to Build, Operate and Transfer (BOT) the Colombo South Port Terminal. However, this issue has raised questions like why CICT generously ‘donated’ such a large amount of money to a ‘charity’ during their pre-operational stage. Questions are also asked as to on what basis this Foundation was chosen when there are many charity organizations in Sri Lanka that are in dire need of funds to carry out their work. The ‘donation’ had been remitted to Pushpa Rajapaksa Foundation by CICT through The Hongkong and Shanghai Banking Corporation (cheque No. 594691) to the Foundation’s account (No. 204-1-001-5-0003290) maintained at Peoples Bank (Headquarters) on May 21, 2012. CICT is a Chinese company affiliated to China Merchant Holding International. This company was specially incorporated to BOT the Colombo South Port Terminal Project and owns 85% shares while Sri Lanka Ports Authority (SLPA) owns the remaining shares. The Board of Directors at the time this donation was made were Jianhua Hu (Chairman), Yuklau Lam, Yunshu Lid (Executive Director), Rizhong Zhang, Weidong Deng, Yubin Li, Zhenwu She, Sun Ligan (Alternate Director), then Chairman SLPA, Priyath Bandu Wickrema and Managing Director SLPA Nihal Keppettipola. Questions are raised as to why CICT, after making a donation to this Foundation, documented the said amount of Rs.19.41 million as part of the Colombo South Port Development construction cost? According to Clause 62.3 of the agreement, CICT and SLPA had entered into, it had been agreed to pay the CICT a certain percentage of the value of the construction cost of the terminal infrastructure after the completion of the contract period of 35 years. Clause 62.3 says, ‘If this Agreement is terminated on expiry of the Term of this Agreement, the Ports Authority shall pay the Terminatiown Compensation to the Operator as follows- (a) take over the Terminal Infrastructure without any compensation to the Operator and, (b) pay the Operator the net book value of the Movable Assets and facilities existing at the Terminal on the Termination Date as Termination Compensation’. As the money for this donation too had been documented as construction costs, the taxpayers have to bear a certain percentage of this amount (Rs.19.41 million). SLPA confirmed with this newspaper that they will have to pay CICT the net book value of the movable assets and facilities existing at the terminal, when the term of agreement expires. 1. Was the donation given to PRF the first CSR project carried out by CICT? If the answer is no, can we know to whom such contributions have been made, how much and when? 2. What was the criterion CICT followed to choose PRF? Did the request come from PRF or following a recommendation made by some party? 3. As you have stated that the Rs.19.41 million was a donation, what made CICT to document this amount under construction work? 4. Has the CICT made this donation with the Board’s approval? If so was it the Board that decided to capitalize this expense in the construction cost? 5. Did Sri Lanka Ports Authority agree to document this money donated as construction cost? 6. If not, did they at any time make any request to CICT to document the said amount as a recurrent expenditure? If yes, did CICT abide by the instructions and if so when? In reply to the above questions, this newspaper received an e-mail which has been produced below. Thank you for your mail below. I appreciate the time you have taken to send out this mail to me. Please be guided that everything CICT has to say on this matter has been communicated via the press release which I have attached for your kind reference. When the Auditor Generals Department was contacted to obtain a clarification as to whether a donation can be accounted as construction cost, a Deputy Auditor General, who wished to remain anonymous, told this newspaper that a donation cannot be documented as an expense in the construction cost and must be documented as recurrent expenditure. “As they have capitalized the money they have paid to a charity as an expense in the construction cost, this cannot be called a donation and amounts to a commission. Money paid as a commission to get a contract or to get any approvals to start a project is accounted as construction expenses. But nowhere in the world is a donation that was made considered as a construction cost,” the source said. Though members of the Rajapaksa family and senior members in the Joint Opposition (JO) refuted the New York Times claim, the focus is now on the former first family and the JO as to what they have now got to say about the payments they have received during their regime. Although the Colombo 7 address was the official address given regarding the Foundation at the time it was formed on November 24, 2010, later this charity had been operated from Basil Rajapaksa’s office at Orutota Road, Gampaha. While Pushpa Rajapaksa headed the Foundation, it also had Pushpa Amaratunge as its Vice Chairman, Mahendra Prabath Ramasinghe as the Treasurer and Nandasiri Yapa and Manabharana Madigasekera as Trustees. ‘Meanwhile, with the appointment of the new Board of Directors after the fall of the Rajapaksa regime in January, 2015, Finance Manager SLPA, by a letter dated March 27, 2015 to Chief Executive Officer, CICT had requested to clarify on the payment made to Pushpa Rajapaksa Foundation (PRF). The letter further states, ‘We have been informed by the Crimes Bureau that a sum of Rs.19.41 million has been given to PRF on May 21, 2012 by CICT. The explanation is urgently required for the following in order to clarify the above payment. (b) Whether the amount had been included in the construction cost as this had been granted during the period of construction. (c) Kindly inform the sources of fund. (d) Please forward audited financial statements for the year 2011/ 2012/ 2013/ 2014. Your urgent response is very much needed as SLPA is answerable to the Crimes Bureau’. In response to the above, by letter dated March 30, 2015, Chief Financial Officer CICT has written to the Director Finance which states the following, ‘We refer to your letter of March 27, 2015 reference FA/MA/CICT/2, and give below our explanation for the queries raised by the said letter. (a) Payments were made utilizing CICT funds. (b) Yes, CICT capitalized this expense in the construction cost. (c) The funds were from funds of CICT accumulated from Equity and Loan capital. (d) We have already handed over to SLPA the requested audited accounts up to 2014. However we now resubmit copies of same as requested’. Following an audit query carried out by the Auditor General’s Department, regarding an alleged payment amounting to Rs.600 million and made to PRF by CICT, Chief Finance Manager SLPA by letter dated November 27, 2015 to the CEO, CICT has further requested to clarify whether the amount stated in the audit query is correct or if it differs with the correct amount to let them know how CICT had accounted the amount as per the audit query. Since the ‘donation’ made to PRF had been documented as an expense in the construction which is detriment to the Government of Sri Lanka, Director Finance, SLPA Shirani Wanniarachchi once again, by letter dated December 7, 2015 (Ref: FD/FA/C/82-XV/17/2015) to CEO of CICT has stated that the Auditor General has not accepted how the donated money has been accounted for as construction cost and to adjust the payment as an expenditure in CICT financial statement. The letter further states, ‘According to the view of the Auditor General, this accounting treatment is not acceptable and this has been mentioned in the audit query that we have sent to you on November 27, 2016. SLPA is also of the view that such expenses should not be treated as Construction cost and should only be treated as expenditure in the year it was incurred. Therefore we hereby inform you to adjust your financial statements accordingly’. When replying CICT in its letter dated December 9, 2015 to the Finance Director, SLPA had said that once they finalize the accounts of the construction contract they will clear the construction in progress account by transferring specified assets accordingly. However, when an official e-mail was sent to SLPA Chairman on July 10, regarding this issue and to find out whether CICT had removed the donated money from their construction cost and had included it in their recurrent expenditure, Finance Director SLPA Shirani Wanniarachchi in her reply confirmed with the Dailymirror that CICT has confirmed that the amount paid had been debited as recurrent expenditure and deemed as a donation. Following this e-mail, another e-mail was forwarded to the Chairman and the Finance Director of SLPA on July 11, to get the above statement confirmed and requesting them to tell this newspaper in which financial year (profit and loss account) CICT had reflected this donation as a recurring cost. In this e-mail it was also asked how many recurring months and from which month/year CICT had started the recurrent schedule. However there was no response from SLPA until the paper went for publication. Hence there is some doubt as to whether CICT has removed the donated money from the construction cost and had shown it in the recurrent expenditure or whether they have not made any changes to their initial plan to capitalize this expense in the construction cost. 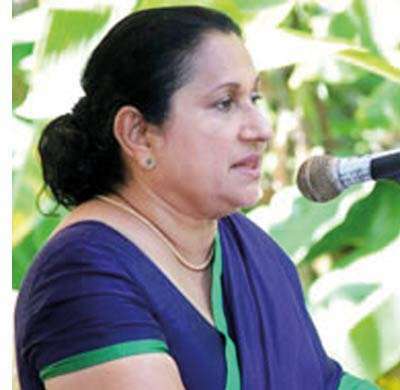 Although allegations have been levelled against the former regime for offering the contract to construct the Colombo South Port Project to CICT without following Government procurement guidelines, Finance Director SLPA in her reply, had stated that SLPA received only one bid- which was from CICT- when quotations were called for and that bidder was selected with the approval of the Cabinet of Ministers during the Rajapaksa Government, as per procurement guidelines. 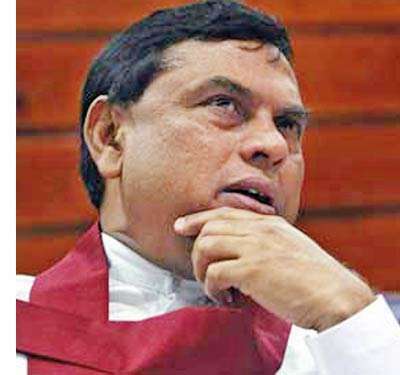 Meanwhile according to the ‘B’ Report submitted to Fort Magistrate Court (Case No: B 586/15) by the Financial Crime Investigation Division (FCID), when questioned, former Chairman SLPA Priyath Bandu Wickrema and Managing Director SLPA, Nihal Keppettipola, have both stated that although they were in the CICT Director Board during the time, the ‘donation’ had been made to Pushpa Rajapaksa Foundation in 2012, they were unaware of the payment nor had they discussed the matter at a Board Meeting. “Can Priyath Bandu and Keppettipola claim that they were unaware of this transaction and if so this matter had never been discussed at any of the Board Meetings? They have misled the investigators. Action has to be taken against both these former officials,” sources alleged. The sources further asked as to how the previous regime granted the contract to construct the South Port Terminal to CICT and to transfer the container handling process to SLPA only after 35 years when this project would be given to SLPA in order to generate more income to the country? “The most difficult task in the port expansion project was the construction of the breakwater. This contract was offered to a Korean company with an investment of Rs. 85,000 million being made from a loan obtained from the Asian Development Bank (ADB). After the construction of the breakwater, there was no necessity for the SLPA to give the contract to build the South Port Terminal and to install the gantry cranes to CICT, because it could have been done by us. Although Priyath Bandu Wickrema and a few of his loyalists in the SLPA Director Board, treasury representatives and the Attorney General’s representatives, who were involved in the dialogues to hand over the terminal construction and BOT to CICT, the treasury representatives should have intervened and showed them what losses the country would suffer if this project was given for a 35-year period,” sources alleged. According to the sources, when CICT completes 35 years and hands the container operation service to the SLPA, the gantry cranes would need replacement. In such an event the SLPA will once again have to invest heavily to get new gantry cranes installed,” sources claimed. According to the sources, most of the larger ships that enter the Colombo Port enter the CICT terminal because of its depth. “The SLPA terminals cannot accommodate the larger vessels as its depth is much lesser than that of the CICT. Hence most of the larger vessels enter the CICT terminal and SLPA generates an income worth US$ 4 from each container as royalty. The income generated through this royalty is not even sufficient to pay the loan interest. Had this project been given to SLPA, by now we could have settled the loan and generated a huge income from the south terminal,” sources said. The sources further accused a high ranking politician in the good governance administration for his attempt to offer the east terminal project to a foreign company instead of providing the necessary funds to construct the terminal and install the gantry cranes. “Why can’t this Government provide enough funds for the east terminal project and settle the loan with interest within few years and then generate massive revenue like how CICT is now generating,” sources added.